Consistently eating well is a chronic challenge for me. When I am stressed, rushed, and – especially – lazy, I tend to open my fridge and pick out the items I don’t have to prep to eat. Salad sits in my fridge, wilting. Instead, I go for nuts and fruit. And more fruit. And then again. A few weeks ago, I started up my coffee habit again. This, combined with my tendency to eat sugar, is a recipe for exhaustion. In my unscientific opinion, sugar and caffeine provide the body with false means of energy. Caffeine is a stimulant, much like adrenaline. It wires you up and keeps you going even when your body lacks the nutrients it needs. Chronic sugar intake exhausts your body’s ability to regulate blood sugar, tires out your pancreas, which produces insulin, and increases your intolerance to insulin (a condition often diagnosed as pre-diabetes). Sugar is also reported to be a major factor in cancer, as chronic sugar intake provides the cancer cells with a never ending source of growth energy. I ate way too much sugar and caffeine yesterday, so much so that is a wonder I have not turned into a pile of sugar. The price I paid was exhaustion, both yesterday and today, from poor food choices and a too-hectic schedule. I wondered why I have been unable to learn this lesson. When I have shared with my mother my desires to stop eating sugar, she provides a ready excuse: it’s the holidays, your birthday, a Sunday afternoon when it’s sunny, it’s just one cookie. You would think my mother is built like a house. While she does have weight in her belly, she seems to carry it well. My struggles with energy and eating well have not been her struggles. I seem to be sensitive to sugar, unlike her. I think I am a sugar junkie. 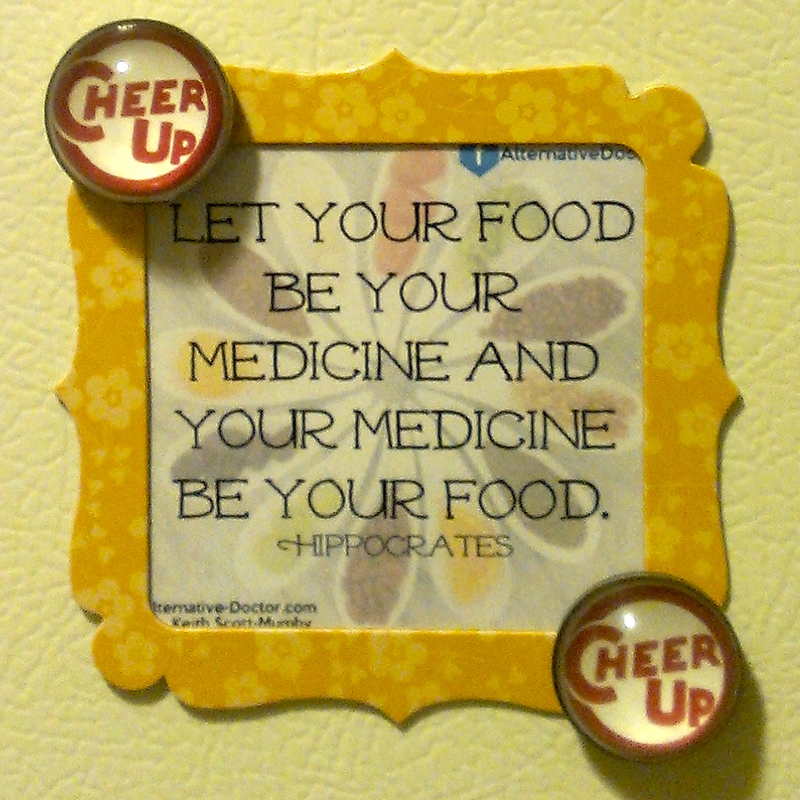 In writing my evening pages today, I decided it might be helpful for me to post inspirational quotes regarding healthy eating in a couple important places. 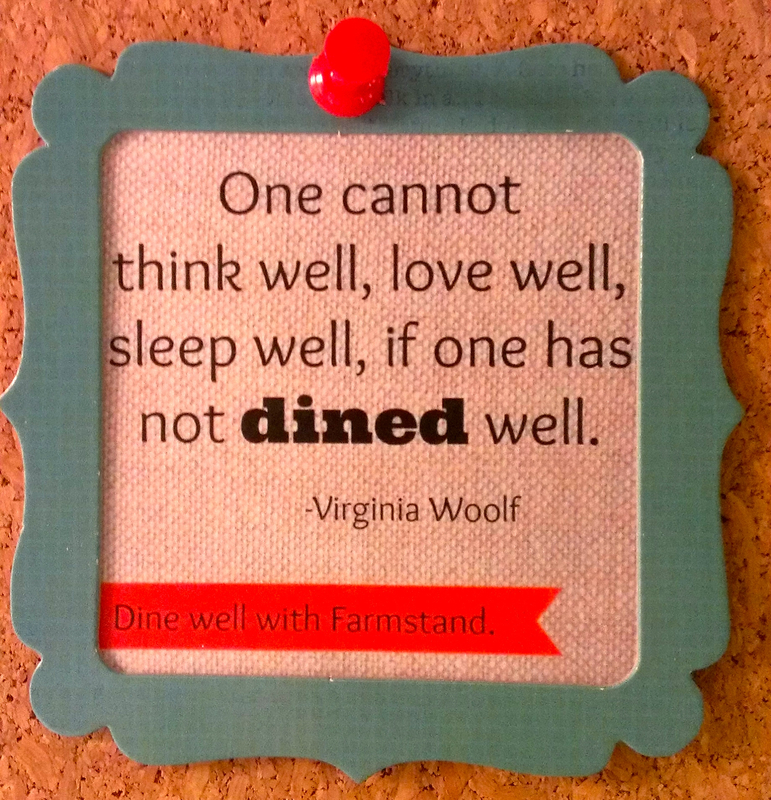 Image found at http://blog.farmstandapp.com/2013/11/12/5-awesome-food-quotes-you-should-know/. The frame is my addition. Image found at http://alternative-doctor.com/infographics/let-your-food-be-your-medicine/ The frame is my addition. For myself, I find that positive reinforcement works much better as a motivation tool than dire warnings against what happens if I do not eat well. Slowly but surely, my living area will contain images and photos of quotes, people, and place that remind me that love and loving choices are the way to make my way through any decision, especially ones with such a profound impact on all areas of my life. 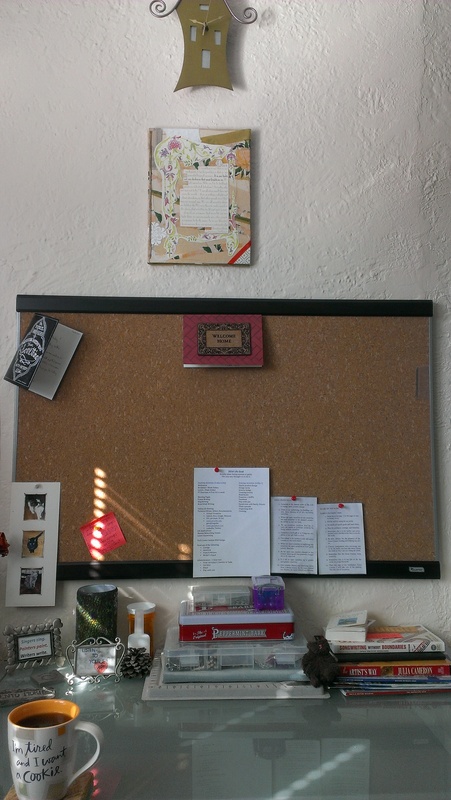 In creative wave #6 of yesterday’s post, I described wanting to put up a cork board with pictures of loved ones, inspirational quotes, poetry, and reminders, which I call my Pinspiration Board. I tried to control myself from tacking up paper because I wanted to start with images, but I just couldn’t help myself. I tacked up a housewarming card from a beloved friend, a card from my dear husband, pictures of three cats (two of whom passed away), my list of life goals for 2014, a lists of Basic Principles and Rules of the Road from Chapters 2 and 3 from The Artist’s Way by Julia Cameron, and a sticky memo of ideas. My Pinspiration Board replaces a bookshelf that I moved to a wall behind me and a large framed print that I moved to the wall to the left of my desk. The small collage framed above the board was made to me by another beloved friend and was displaced by the hanging of the large framed print to the left. With the bookshelf gone, I have more space available at the back half of my desk surface. Not only does my desk feel roomier, but the room itself feels like it opened up. I was able to stack my jewelry supplies higher. To the right, I stacked only the books on the right that I am immediately reading or using. To the left, I have two framed print with words and pictures that keep me focused on my writing and my art. An electric candle adds a stained glass glow to my corner as I work in the evenings as it gives off a faint perfume. No desk of mine would be complete without a full cup of steaming hot coffee. I’m mad about coffee! Unfortunately, I usually am so engrossed in my morning writing that my coffee goes cold before I have the opportunity to drink the full cup. The cup holding my morning java was given to me by a third beloved friend. We used to work at a college together, and she bought me this cup because I often talked of feeling tired or wanting to eat a dessert. Vive le café! Vive l’écriture!